In my last post, I touched on some of my other interests besides crafting. Today’s post focuses on one of those other interests: cooking! As you know, Adam and I headed down south to visit with his Mom and family over Memorial day weekend. When we got there, she informed me that one of his cousins has an awesome garden that was busting at the seams with blackberries and we were invited to pick as many as we wanted. Well, try to hold me back from that. When I was little, I loved traipsing off into the woods behind our house with my sister in search of blackberry vines – much to my mother’s chagrin. She was too worried about snakes and hunters who might mistake us for wild game. 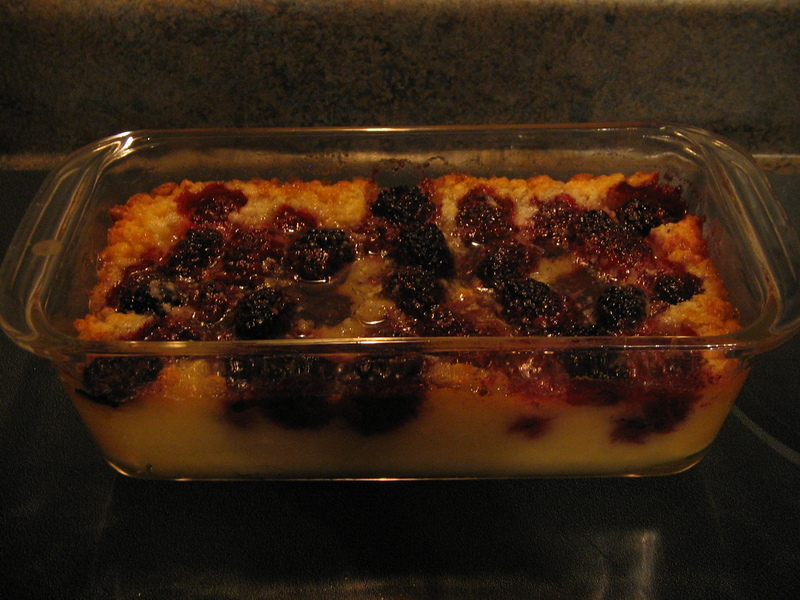 One of my most memorable blackberry picking adventures began with me pulling up my shirt tail to use it as a basket, since I had forgotten to bring one, and ended with me dumping all of the goods into a colander only to discover that the bottom of my shirt had been dyed a beautiful dark purple. Live and learn. So, last weekend, with appropriate containers in hand, my mother-in-law and I had a go at the blackberry vines and managed to come away with two pitchers-full, and only a few scratches. We divided up our pickings, and I went home with a gallon sized storage bag full of huge blackberries – I kid you not, some the size of my thumb. Adam and I can’t possibly go through a gallon of blackberries before they go bad, so here’s how I solved that problem. Basically, you combine the ingredients, pour it into the plastic jam jars, and freeze. That’s it! It makes five jars of jam, and the jars are,conveniently, sold in packs of five. It was so easy, yet so impressive. And they keep in the fridge for three weeks, and in the freezer for up to a year. Melt the stick of butter in a loaf pan in the oven while it is preheating to 350. Mix the flour, sugar, and milk together. Pour the batter into the loaf pan once butter is melted and bubbly. Sprinkle the fruit on top of the batter, and bake for 1 hr to 1 hr 15 min, or until top begins to turn golden brown. Easy peasy. 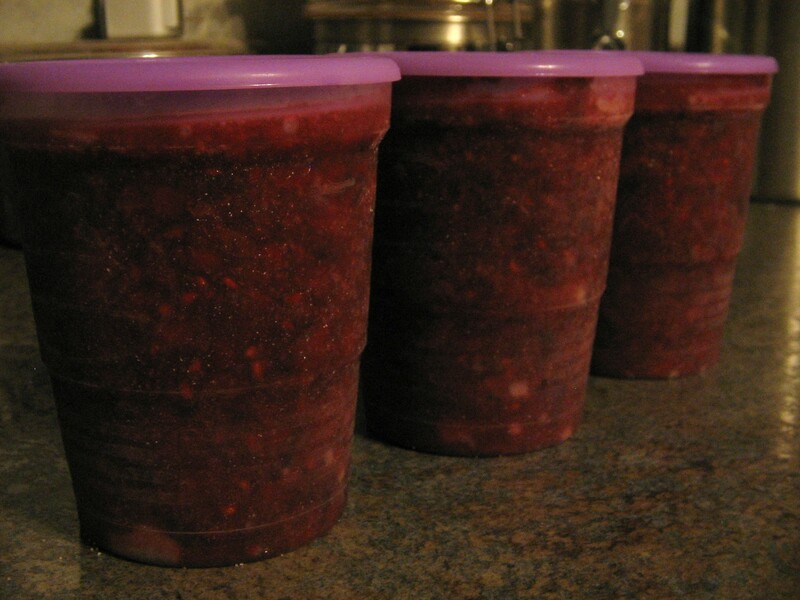 Even after making five jars of jam and two cobblers, I still had plenty of berries left over, so I froze the rest. Now I’ll have them on hand for whatever I may need them for in the coming weeks. If you try the freezer jam, or the cobbler, I’d love to hear how it turns out!